The film and food pros at Austin's Alamo Drafthouse show us how to pull off the ultimate movie night. When it comes to American leisure time, there are few activities as universally loved as the classic dinner-and-a-movie combo. But what if instead of separating the two into distinct experiences, you combined them into one seamless cinematic feast, with a menu designed to be served right along with the action in the film? 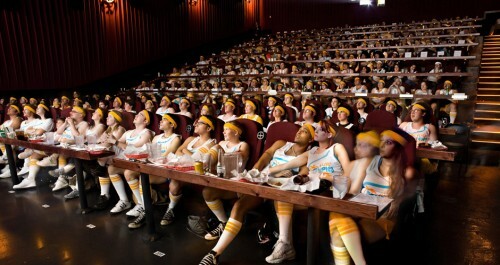 Since 1997, that’s been the mission of the the Alamo Drafthouse, the Austin-based theater franchise that helped pioneer the restaurant-inside-a-cinema concept, which allows you to eat and watch at the same damn time. And we’re not just talking about glorified popcorn and nachos, either. Alamo’s devotion to the perfect pairing of film and food runs the gamut from the epic—like a legendary eigh-course “Hobbit Feast” to go with a marathon screening of the Lord of the Rings trilogy—to the relatively restrained (a one-night-only screening of Conan The Barbarian with roast turkey legs and a plate of bone-in meats, just like they do it in Cimmeria). Here’s the best part: If you don’t live anywhere near an Alamo, or you’re looking to save money, impress a date, or just catch up on your Netflix queue, there’s no reason you can’t pull off one of these food-driven movie nights yourself. To aid you in the quest to craft a compelling movie-and-menu pairing, we hollered at Drafthouse’s concept chef, Trish Eichelberger, to find out how she does it. You may not be able to match her pro moves just yet—pairing dinner with Silence of the Lambs takes an experienced hand—but her best practices will set you on the path to greatness. Here, Eichelberger breaks down eight essential tips for transforming your next movie night into a feast to remember. When it comes to American leisure time, there are few activities as universally loved as the classic dinner-and-a-movie combo. But what if instead of separating the two into distinct experiences, you combined them into one seamless cinematic feast, with a menu designed to be served right along with the action in the film? Since 1997, that&apos;s been the mission of the the Alamo Drafthouse, the Austin-based theater franchise that helped pioneer the restaurant-inside-a-cinema concept, which allows you to eat and watch at the same damn time. And we&apos;re not just talking about glorified popcorn and nachos, either. Alamo&apos;s devotion to the perfect pairing of film and food runs the gamut from the epic—like a legendary eigh-course “Hobbit Feast” to go with a marathon screening of the Lord of the Rings trilogy—to the relatively restrained (a one-night-only screening of Conan The Barbarian with roast turkey legs and a plate of bone-in meats, just like they do it in Cimmeria). Here&apos;s the best part: If you don&apos;t live anywhere near an Alamo, or you&apos;re looking to save money, impress a date, or just catch up on your Netflix queue, there&apos;s no reason you can&apos;t pull off one of these food-driven movie nights yourself. To aid you in the quest to craft a compelling movie-and-menu pairing, we hollered at Drafthouse’s concept chef, Trish Eichelberger, to find out how she does it. You may not be able to match her pro moves just yet—pairing dinner with Silence of the Lambs takes an experienced hand—but her best practices will set you on the path to greatness. Here, Eichelberger breaks down eight essential tips for transforming your next movie night into a feast to remember. 1. Pick the movie first. 2. Don’t worry if there aren’t direct references to food. Not every movie is going to be Julie & Julia (though if you do pick that one, consider Eichelberger’s brown butter vinaigrette recipe). But that’s okay: Eichelberger explains that there are other places to draw inspiration from besides what you see the characters eat on screen. “If there aren’t any direct food references, either you start looking at the time period it’s set, or the place that it’s set. That can be a good place for inspiration.” What did they eat in the Charenton insane asylum during the French Reign of Terror? Spice up your viewing of Quills by coming up with your own culinary answer. 3. Give 'em what they want, but not the way they expect it. “There are [films] I've done where you have to do something specific,” Eichelberger explains. “Like Fried Green Tomatoes—you have to do fried green tomatoes at some point. To make it more interesting and not just settle for the straightforward stuff that you see in that movie, I decided to include the ingredient honey in every single course, because the character Idgie Threadgoode is nicknamed ‘The Bee Charmer,’ and that's an important part." If there is a food in the name of the film, or an iconic scene revolving around a very specific dish, don't avoid it. Instead, find ways to balance out the obvious with more subtle references throughout the rest of the menu. 4. Don’t be afraid to get conceptual. 5. When in doubt, consider a foreign film. 6. You can make someone’s dreams come true if you go sci-fi/fantasy. 7. Bonus points if you can make an unexpected movie sound delicious. Sometimes your desire to watch a specific movie will not be conducive to creating a menu. But even in those circumstances, there are ways to succeed. For instance, Eichelberger was recently tasked with creating a Silence of the Lambs feast. “That movie has its graphic moments,” she admits. “It’s not a total stomach-turner, but we’re kind of going out on a limb with that one.” Still, it can be particularly satisfying to figure out creative ways to combine a weird movie with a delicious menu. “I came up with a skinless chicken wing for that one. I definitely get a buzz off of it when I figure something out,” Eichelberger says. 8. Know where to draw the line. While the Alamo Drafthouse did once celebrate the world premiere of The Human Centipede II by serving three suckling pigs laid out nose-to-tail, Eichelberger says that there are some movies that are just too unappetizing to consider for a menu. “I did veto one of the programmers’ ideas to serve Spaghetti-O’s during the movie Seven,” she says. “There are certain lines you don’t cross.” Star Trek soups and skinless wings—not to mention Harry Potter scones and Middle Earth delicacies—are all fair game, though. There’s no shortage of food-friendly options streaming on Netflix right now. Want to start with an easy one? It’s hard to go wrong with a Japanese feast crafted around the award-winning documentary Jiro Dreams of Sushi. Feel like going conceptual? The Mike Judge comedy Extract could be the perfect setup to experiment with pure flavor compounds like vanilla and almond extract. Friends with a lot of nerds? What better way to give them a taste of their dreams of flying aboard a Firefly-class transport ship than by serving them Fruity-Oat Bars just as River Tam flips out during Serenity? The only limits are your kitchen, the Netflix Instant library, and your imagination. Now go! Page 7. Bonus points if you can make an unexpected movie sound delicious.